Gold-medallist RJ Nelson (middle) flanked by Ruben Navarro (silver) and Alejandro Renteria (bronze). Photo by Lesley-ann Nelson. RONNIE NELSON Jnr. Captures Gold at The Central American's and Caribbean Chess Festival. 25-29th July 2007 -Guatemala, 3rd CAC Chess Festival. Ronnie Nelson Jnr. continues to keep the Trinidad and Tobago flag flying high, at the recent C.A.C games when he captured the gold medal and Candidate Master title, according to FIDE Regulations. He took the lead very early in the game on the 1st board up to the 4th rounds, and continue his battle despite a loss in the fifth rounds, finishing with a total of 6 wins out of the 7th Swiss - round tournament on the first board. His Colombian counterparts, Ruben Navarro and Alejandro Renteria kept a close pursuit but was no match for the chess tiger, they had to settle for 2nd and 3rd place respectively, taking the silver and bronze. Ronnie did his country proud at the age of 8 years and lived up to his nickname the "Caribbean Chess Tiger". 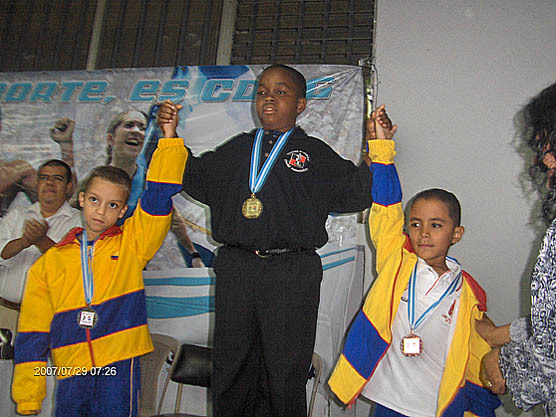 In the sub-12, Keron Cabralis took the silver medal. The National team comprise of the following players- Javanna Smith, finishing in 4th place, Renuka Ramdass, Samantha Seecharan, Joseph Gill, Esan Wilshire, Raphael Guerrero, Vandoff and Alpacino Smith. As the tournament ended the Colombian celebrated, gaining 6 wins of the 12 matches, with a delegation of 11 players. The Colombian was crown Central American and Caribbean Champion for 2007, Guatemala followed with 2 Championships and 5 Sub-Champion, Venezuela was third with 2 Championships, then followed by El Salvador and Trinidad Tobago with Gold and silver Champions in the Sub 8 and Sub 12 male. All the first place Champions acquired the title of CM (Candidate Masters) according to FIDE Regulations and will be next year official players for next Pan-American games which will possibly take place in Ecuador in 2008 in Guayaquil or River Basin. Ronnie wish to thank his family, sponsors , spiritual -director, media supporters, Ruskin Mark, of N.C.C , Jaye-Q Baptiste, of the Jaye-Q show on CNC3, Robert Dumas (sports anchor) of CNMG, Valentino Singh of Sports -Arena, Lester Ford -photographer and talk radio- 91.1 and his friends- Kyle, Mikyle and Kilan who came to the airport to welcome him home.